Probably the best blog on the internet. Fever finally broke. Going camping in the rain with two kids under 3. Hiking eagle Mountain tomorrow. Life is pretty good. And when i say “camping in the rain” I probably mean a hotel room in Duluth. Well, here’s the whole extended story. Grab some popcorn. Friday was one hell of a day. I was sick half the day and spent all afternoon trying to figure out if I was going to leave work early or not. But I thought about it too long and just spent the whole afternoon watching my cube spin in circles. Mel and I had been planning on waking up early Saturday morning and heading out for the North Shore for a camping trip, since our son CH is over 3 months old and hasn’t been yet, but I was feeling lousy and didn’t think it was gonna happen. I fell asleep around 8:00 PM and slept through till around 9:00 AM the next morning. I woke up feeling great, though, so we loaded up the car anyway and started driving north, despite the fact that it was raining. We felt a little dumb going camping in the rain, but we knew if we didn’t go for it this weekend it wasn’t going to happen at all this year. Well, I thought I was over the fever, but it returned with a vengeance right around Duluth. Compound that with the fact that it was still raining, and camping was looking pretty unattractive. Left with a few hours to kill, we hit up the Great Lakes Aquarium, which probably would have been better had it not been spinning around in circles. I’m pretty sure that for at least a few minutes, my daughter KP was running around on some indoor slide while I was slumped over a fake log. Me and CH checking out stars and stuff. CH loves stars. Dinner was a delicious cold-cut pulled off a deli sandwich. Dumb picture of an old tent. I was worried that sleeping was going to be a miserable time with a restless toddler kicking me in the gut over and over again, but nope. Smooth sailing. The kids were great and we were all just snuggled right in all night. Mel, KP, Pink Penguin, Tiger, CH. Mel and KP snuggled into bed. CH waking up in a foggy tent. In the morning, we drove over to Eagle Mountain, the highest point in Minnesota, and hiked to the top. KP sat in her new “Special Backpack”. Some dumb bridge we crossed. Eagle Mountain from across the lake. The trail was pretty much just a bunch of rocks. Eagle Mountain is pretty underwhelming compared to some of the other great mountains out there to hike. At 2,301 feet above sea level, it almost qualifies as a foothill in most states. That being said, the hike was physically taxing, especially when lugging a two year old around on your back. I’ll admit, I pulled a few muscles and could barely walk the next day. I’m blaming the fever. On the way home, we stopped off for a bit of sight seeing along the north shore. OK. Well that’s the only thing I’ve done worth writing about in the past 6 months. How about you? Welcome to Your Official Travel Guide for Biking the Luce Line State Trail. In this short inspirational post, I will tell you everything you need to know about biking the Luce Line State Trail so that you can pretend you’ve actually done it yourself. I’m doing the biking for you, so you can enjoy the wonders of the great State of Minnesota without leaving your comfortable living room. In this post, you will read all about the features of the trail, survival tips for beginners, and sights you should expect to see along the way. If you’d like, you can move your feet up and down in a pedaling motion while you read to help foster the illusion of physical activity. The Luce Line State Trail is about 63 miles long, and only goes as far east as Plymouth. But Three Rivers Park District manages the rest of the same rail-to-trail corridor, where it is called the Luce Line Regional Trail, for an additional 9 miles. Same difference, except that the Three Rivers portion is paved, and the DNR portion is unpaved. Big Difference. By the time you start biking from your home in South Minneapolis, the trip will be about 82 miles each direction. Here is a map of your entire vicarious journey. You will leave your home early on a Saturday morning with a singular goal in mind: to ride a bicycle to the wonderful metropolis of Cosmos. You plan to camp overnight at Thompson Lake near Cosmos, and make the return journey the following day. A couple of little trails in Watertown. You will want to stop at the small grocery store and buy several apples, beef jerkey, and some sodas. Do not skimp on the sodas. Next, you will continue on the luxurious crushed limestone trail to reach the slightly-less bustling berg called Winsted. Upon closer inspection, you will discover that it appears to be a fine town, and you will daydream about eating pizza on a bench next to Winsted Lake. Do not let your mind get carried away. You have a lot of cycling ahead of you and there is no pizza (there should be pizza). Some park next to Winsted Lake. As you continue on your journey, you will get momentarily lost as you try to find your way to the trail on the other side of town. You will quietly curse the City of Winsted for not providing a continuous trail through the city, or at least providing some cheap and simple wayfinding signs directing cyclists towards the trail. When you do find the trail, your spirits will sink a bit as you realize you have reached the end of the crushed limestone surface. The trail is now barely a gravel road. It is here that you will realize that the Luce Line State Trail is really more of a snowmobile trail than a biking trail, which is why you have never really heard cycling enthusiasts talk about what a great trail it is. The world will make more sense for a few short moments before reality sinks in that you will have to continue the rest of your journey on a gravel road. You will not be properly equipped. You will take photos of yourself and your travel companions at this time. Trail is more or less a gravel road. This part of the journey will be slow-going, as cycling on gravel is hard, and it will be a very hot day. You will start to drag a bit, and you will begin to run low on water. As you approach the town of Spring Lake, you will plan to stop for a water break. To your complete surprise, you will find that the trail passes right by a municipal swimming pool. Rejoice! You will park your bikes outside, ask the 15-year-old sitting at the front desk for permission, and proceed to fill your water bottles in the sink. While they’re not looking, you will also stand in the shower which will feel heavenly when you get back on the bike and head towards Hutchinson. Hutchinson will come soon enough, and you will be ready to stop for lunch. You will find a mexican restaurant, and you will eat burritos. Do not skimp on the burritos. After lunch, you will spend a few minutes checking out the City of Hutchinson, and you will be pleasantly surprised by its pleasant surprises. You will buy several more apples, some crackers, and more sodas at The Fresh Place. On your way out of town, you will pass by this neat little part of the river where all these rocks dam up the river to make a little lake thing. You will like it, as well as the lovely little park in town on the edge of the river. You will sort of wish you were just staying there for the night. But you have set a goal (!) to vicariously travel to Cosmos, and you are too determined to stop short of your goal. Your journey will continue on a rapidly deteriorating trail until you reach the small town of Cedar Mills. At this point, the trail will be completely impassable for bikes, and you will have to travel along the shoulder of Highway 7 to reach your final destination of Cosmos. Huzzah! Victory is yours, vicarious traver! You have done it! You have reached the city of Cosmos without leaving the comfort of your home! At this point, you will be very tired, and after taking a few minutes to catch your breath, you will proceed the final mile to Thompson Lake, your planned destination for the evening. You will have grand visions of a cool, clear oasis perfect for swimming and camping. As you enter the park, you will be optimistic. The grass is green, freshly mowed and well cared for. The gazebos and shelters will look inviting. Unfortunately, you will quickly discover that Thompson Lake looks like a lousy place to go swimming. It’s shallow, murky, and full of greenery. Also bugs and mosquitos everywhere. Your spirits will sink, and the thought of spending the night here fighting the mosquitos will not be a pleasant. You are momentarily distracted, however, by the tallest slide you’ve ever seen, a sure safety hazard that is one poorly-balanced child away from a lawsuit that bankrupts the entire County. You will ask yourself if parents really let their kids play on it. Seriously, though, look at this thing. It is simultaneously badass and terrifying. At this point, you will have to make a difficult decision. You will be dead tired, but you also do not want to spend the night at Thompson Lake, or in the Cosmos City Park. You will decide to bike the additional 18 miles back to Hutchinson to stay at the adorable lakeside campground you saw earlier. The one with a beautifully inviting lake, flushing toilets, and heated showers. It will be worth the 18 miles, plus you’ll get to claim you biked 100+ miles in one day, something you will have never done before. The return trip home the next day will be less eventful. Since most of the Luce Line State Trail isn’t paved, you’ll decide to detour slightly sough and ride the Dakota Rail Regional Trail instead. You’ll enjoy the smooth paved surface, and the new scenery, and you’ll enjoy a lovely dip in Lake Waconia on the way home. Huzzah! You’ve don’t it, vicarious traveler! You’ve conquered the Luce Line State Trail. Feel free to print this post, sign your initials to the bottom, and hang it on your refrigerator to remind you of your accomplishments! Good job, weary traveler. Time for a nap. OK, ready for another riveting weekend adventure update? We took KP on her first camping trip ever. We didn’t really know how well it was going to work out, so we chose some pretty cushy accommodations and set our expectations low. We chose the Cannon River Wilderness Area, part of the Rice County Park System. We didn’t get there until about 6:30 PM friday night, and spirits were high. The camping sites here are walk-in style, but it’s only about 1/8 mile or so. Mel carried all the gear and KP, and I carried the camera so that I could blog about it later. KP is a bit of a freeloader. The Cannon River looked pretty good. Unfortunately for us, the two closest campsites were already taken. These are first-come-first-serve, and we were too late. But we’d come this far, so we weren’t about to quit so easily. I took a few more photos of Mel carrying the gear and KP back to the parking lot area, and we just decided to camp near the pavilion in the grassy park area. This is against the rules, but we’re such risk-taking rebels that we did it anyway, Rice County Park Rules be damned. Also, we didn’t know how sleeping with KP in a tent was going to work out and we were half expecting to give up around Midnight and go home anyway. We didn’t set up the tent until right before we were ready to sleep, just in case one of the dastardly Rice County Park Police came to kick the scrubs out of the park. After eating our tin-foil dinner, we decided to go on a night-hike. Up waaaaay past bedtime, and loving it. We were a little worried that KP wouldn’t sleep very well in the tent, but she proved us wrong. She curled herself up into a little ball and slept all night. Experts be damned, KP sleeps how she wants. Also, KP got totally eaten alive by mosquitos, and now looks like she has small pox or something. The next morning, we awoke sharply at 5:00 AM, and snoozed, for another hour. We packed up and were home by 8:00 AM sharp. Even though our camping trip was a maximum of 14 hours, including travel time and sleeping, it was still a great first-time camping experience with KP. How about you? 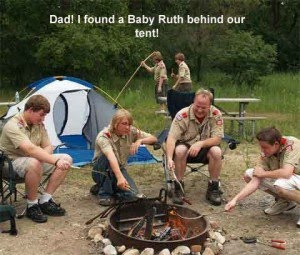 Ever gone camping with an infant? How did it go? Any tips you’ve learned along the way you’d like to share? “But look at your gigantic thighs! You’re so much stronger than I am!” I said. That didn’t help the situation. I think Mel needs to learn how to take a compliment. The island has a reputation for being extremely bike friendly, and we found this to be pretty much the case. There were tons of bikes everywhere, although I’m not exactly sure why. The island is 14 miles long, so it doesn’t exactly scream “bike friendly” or anything. But we did get to spend much of the weekend on our bikes! “Thanks for planning a great vacation surrounding my favorite hobby,” I said. “The internet?” Mel asked, confused. “Oh, I thought that was your 3rd favorite hobby,” she said. “what did you think was my 2nd favorite hobby?” I asked. “Oh…. well we’ve got a pretty good top 3 list going here anyway,” I said. We checked out the city park along Big Bay, and found a sweet beach, and some scenic views. There were quite a few people out laying around on the beach, even if it was cool enough that most people were still wearing sweatshirts. We spent all of Saturday biking, beaching, napping, and just generally gallivanting around the island. Monday Morning, we woke up at a leisurely late hour, ate some oatmeal, rode the bikes back to the ferry, and took the ferry back to Bayfield. Oh, and we bought CHEESE CURDS on the way home. I’d never had them before. They’re super-tasty. I told y’all about how last Saturday Mel and I tried to go bike camping at Willow River State Park but our plans changed after it rained on us all day. We woke up on Sunday feeling a little bit defeated, and we also didn’t really want to go sit on hard metal chairs for two hours, so we decided just to drive out and see the park instead – We weren’t disappointed. After we had finished checking out the State Park, we decided to check out downtown Hudson, WI, a cozy little town along the St. Croix River. We decided to stop in for lunch at The Winzer Stube, a German restaurant that was apparently voted the 17th best German restaurant in the US and received a “10 beer stein” rating (ahead of South Minneapolis’ beloved (but pricey) Black Forest Inn, which was unranked and received only 9 beer steins) in what I’m sure was a very scientific and unbiased evaluation. Anyway, that’s what I did Sunday. What did you do? Ever been to Willow River State Park? How about the Winzer Stube? What did you think? Notice that I’m using the sweet new bags Mel made me for my b-day. This will be their first real road test. We brought along Netflix with us, just to drop it off in the mail on our way out of town. We’re hooked on Dexter and can’t wait for the next disc to arrive! The weather forecast on weather.com said there was a 30-40% chance of rain all day. We knew we were taking a risk when we decided to make the trip anyway – especially when we started feeling the raindrops before we even left the driveway. Here is Mel, making an earnest appeal for blue skies to Zeus, God of Rain. It kept raining the entire trip to Stillwater!!! We were soaked to the bone when we stopped in for lunch at Nacho Mama’s (click on this link if you want to hear some really, really bad MIDI music that sounds like it was made back in 1997 by some kid in his basement on a pirated version of Cakewalk). Here’s the best part. After we rode all the way back to South Minneapolis, as soon as we were on the Midtown Greenway, a mere couple miles from home, the sun came out and it turned into an absolutely lovely evening – but we were too tired to go outside and do anything. I’m going camping with the scouts this evening. The three 11-year-olds (which reminds me – I ought to dig out one of my old 311 albums….) and one of their fathers. And me. The weather forecast calls for 31 degrees, 60% chance of snow showers by tomorrow morning. I wish I’d brought shoes more substantial than an old pair of Chuck Taylors with holes in the soles – or at least an extra pair of socks. I feel a little hypocritical when I send emails to their parents asking them to make sure their children bring multiple pairs of clothing when I can’t be bothered to even grab a different pair of shoes on my way out the door. Our latest adventure was a 110 mile bike ride in southeast Minnesota along the Root River State Trail and Harmony-Preston Valley State Trail. Our adventure started Saturday morning as we packed up the car and stopped at Arby’s on our way out of town for some mid-morning lunch. Our plan was to park the car at one end of the trail, bike to the other end, camp, then bike back the next day – so we’d have to carry all our camping gear with us. But while we were eating lunch, we realized that neither of us were really all that excited about carrying gear with us, that the bikes we were bringing were ill-equipped for such a thing, and that we’d both be just as happy parking in the middle of the trail so we didn’t have to carry our stuff with us (huzzah!). So that’s how we ended up in Lanesboro, MN, which is pretty much at the center of both trails (trail map). Lanesboro is a pretty typical small town, but it was surprisingly active with trail riders and such. The trail cuts right through the middle of downtown Lanesboro, so there were tons of people on bikes everywhere (not shown in photo). Turns out, though, I sleep like a rock. So it didn’t bother me any. Mel had a tough time sleeping, though. The funniest part was that each of the several dozen tents had their own campfires – so there were at least 30 campfires going in this little park that evening. The whole town was really smoky. Plus, TH-16 heading into Lanesboro has a HUGE downhill section we got to ride down that was probably my favorite part of the whole weekend. Seriously, I recommend riding the trails to Harmony, but taking the highways back – just so you get to ride the giant hill! Day one: 49.1 miles. We ate dinner Saturday night at Rhino’s Pizza & Sub Shoppe & received some pretty snarky service from one of the employees, who was visibly unhappy to see us (& the other 8 customers who walked in with us) since it was 8:50 PM and they close at 9:00. I gave an extra dollar tip, hoping that she wouldn’t spit on my burger, but I’m still pretty sure she wasn’t very happy with us. Our burgers were surprisingly tasty, though, and I’m pretty sure she didn’t sabotage our burgers or milkshake, so a thumbs up to Rhino’s (in a this-is-the-only-thing-open-on-a-Saturday-night-in-Lanesboro-at-8:50-PM sort of way). In Houston, we were pretty hungry for lunch, so we quickly found The Brickhouse, which looks small from the outside, but is surprisingly large on the inside. Unfortunately, they didn’t have any soups, but the grilled cheese + bacon was superb, and Mel’s chicken wrap was pretty good, too. Lunch for two including sodas for a measly $11 was fantastic, so another thumbs up for The Brickhouse in Houston, MN. After lunch, it was just 31.1 miles back to Lanesboro before packing up and coming home. Day two: 62.2 miles. Trip total: 111.3 miles! Great weekend for a bike trip! Well i’m just not sure what to do… It’s 1:00 AM Friday morning and I’m sitting in my cube at work. I was given a large project Monday morning and was told it had to be completed the following Monday by 5:00. I mean HAD to be completed. DUE. SUBMITTED by 5:00 PM sharp in complete, final form or else don’t bother… So I’ve been working overtime all week trying to get it done by the end of the week, but it’s not gonna happen. So it looks like I’ll have to work over the weekend. But wait! I’ve already committed myself to go camping with the Scouts Friday night. and Mel and I and some friends had plans to go camping again Saturday night! eek! I can’t do all three. If I go on both campouts I will for sure not have the project done Monday by 5:00 and then work peeps will be very angry. So which campout do I drop? I feel like I’m more obligated to show up to the scout campout, but I also feel completely unnecessary there as well. There will probably be 4-5 boys and probably as many adults, so the scout campout will hardly suffer without my presence. But it also seems pretty selfish to work through the scout campout so I can go camping with my wife instead. Of course, I happen to like my wife a lot more than I like the scouts and would rather spend time with her than scouts anyday. 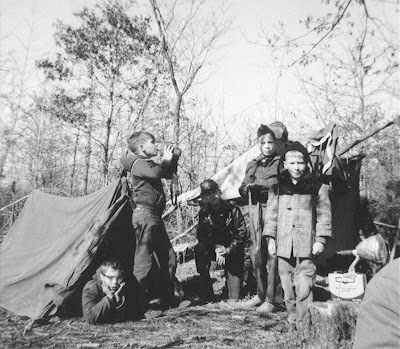 Author Posted on June 12, 2009 Tags camping, scouts8 Comments on What to do??? Melanie and I had planned a camping/biking trip for our adventure this weekend, but it turned into more of a “camping” trip. Why the quotes? Well, let’s just say we added a few stops to our agenda that you don’t find on most camping trips. We were planning to leave town ASAP friday night after work since it was at least a 2 hour drive to the campground. But as I mounted my bicycle to start the ride home after work, I found that I had a flat tire. I had to cal Mel to come give me and my lame bike a ride home. So we were off to a late start. By the time we were on the road, we were on track to arrive at the campground around 10:00 pm. We didn’t want to have to bother with cooking in the dark, so our first stop on our “camping” trip was at Arby’s. We arrived at Rock Lake Campground in the dark, just in time to pitch the tent and fall asleep. We woke up, broke camp, and were back on the road. As we passed through the town of Brainerd, we realized we hadn’t had any breakfast, so the next stop on our “camping” trip was Perkins! After breakfast, we’re finally ready to begin our bike trip. Here’s a photo of us before we start. The Paul Bunyan Trail is a former freight-rail corridor, so its mostly straight, very flat, and extremely easy to ride. A few miles into our trip, it started raining. We tried to tough it out for a while, but when it became clear that the rain wasn’t going to stop anytime soon, we turned back. Total, we probably cycled about 30 miles – still a good ride, but not as much as we were planning. Here’s what we looked like when we finished. After changing into some dry clothes, we noticed that the trailhead was located immediately adjacent to the movie theater in Brainerd, so we concluded our “camping” trip by watching the matinee viewing of The Dark Knight.